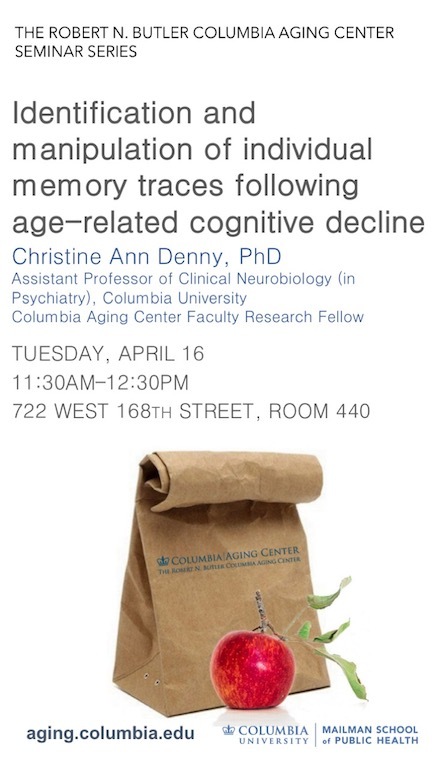 Please join us on Tuesday, April 16, 11:30 a.m. (until 12:30 p.m.) for the brown bag seminar "Identification and manipulation of individual memory traces following age-related cognitive decline" by Christine Ann Denny, PhD. Our speaker is a Columbia Aging Center Faculty Research Fellow and faculty member in the Columbia University Department of Psychiatry. The event takes place in the Allan Rosenfield Building, 722 W. 168th Street, Room 440. ABSTRACT: A memory trace or engram is a neural ensemble activated during learning (or during an individual experience) and whose reactivation by the original stimuli results in memory retrieval. In order to permanently tag activated neurons that are part of an engram, I previously created the ArcCreERT2 mouse line. This line is unique in that it allows for an indelible label of previously activated neurons and thus, allows for a comparison of the cells activated during memory encoding with those activated during memory expression. Most notably, it allows for a brain-wide tagging of an individual memory with single-cell resolution. These activity-dependent tagging mice can be utilized in a number of studies to determine how external factors such as context, mood, stress, or aging influence an individual memory trace, resulting in altered behavior (e.g., affective behavior). We have found that targeted activation of dentate gyrus (DG) memory traces is sufficient to improve memory imprecision following aging and points to the DG manipulation as a target to correct age-related memory deficits.